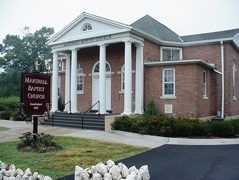 Marshall Baptist Church was established on July 22, 1882 by Samuel M. Athey as part of the Potomac Association. Mr. Athey served as the church’s first pastor. The initial membership totaled 12 and they worshiped in a simple frame structure that was erected on the current church site. In 1923, exactly forty-one years to the day later, the members dedicated the current brick structure. In 1934, additional Sunday School rooms were added, and the Fellowship Hall was completed in 1974. The church has now been in existence for well over 125 years. Many pastors and members have come and gone through its doors, yet Marshall Baptist Church has maintained its purpose as a place of worship, supporting missions so that many may come to know Jesus Christ as Lord and Savior.